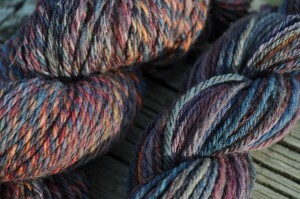 I think the thing that I like most about this yarn is the variety of color. It takes on a different shade every time I look at it it. 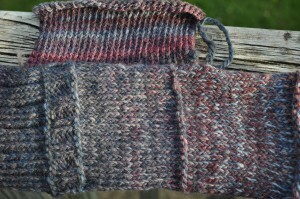 I ended up with 1500 yards of dk-weight 3 ply, which is knitting up beautifully on size 6 needles. This sweater won’t be the overnight wonder of its bulky cousin, but it will be a pleasure to knit. 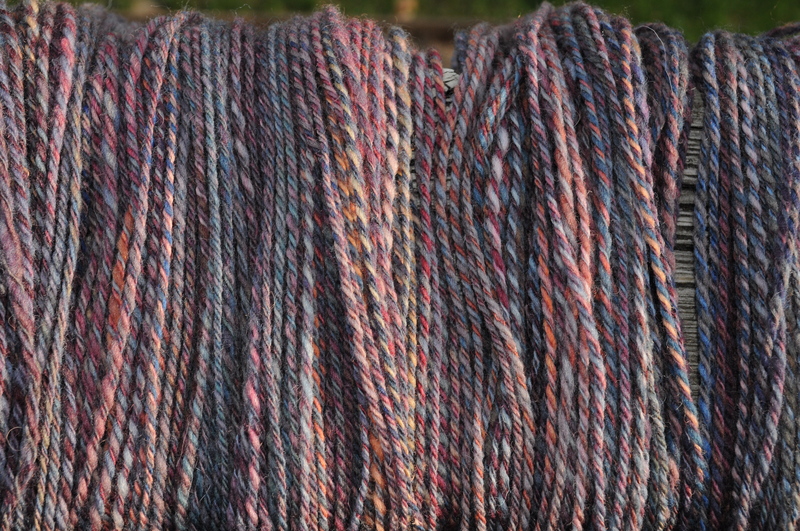 I had some singles left after plying, and 1500 yards seemed like it should be plenty for the sweater, so I decided to do a little experiment and Navajo plied the last 100 or so yards. You can see what a difference the plying method makes. 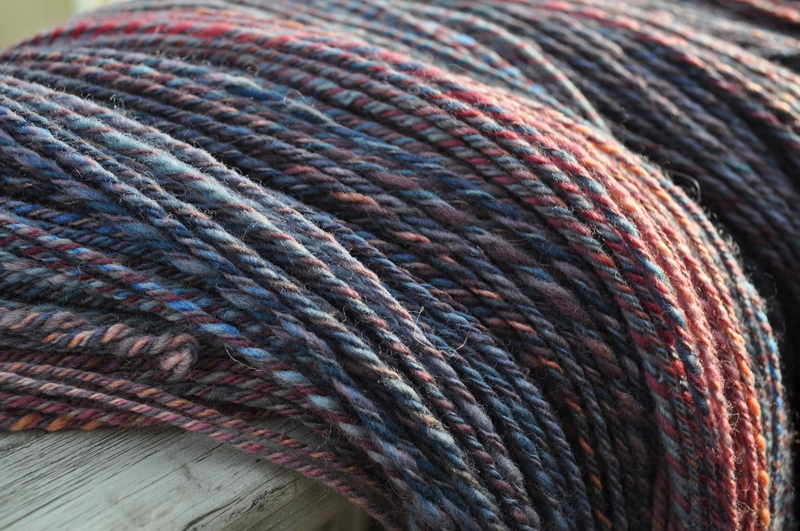 I’m not usually a fan of marled yarns, so I really preferred the Navajo-plied skein with its long single-color repeats and lack of barber pole. As I said, I do like the Navajo skein better, but I really love the way the marled yarn looks when knitted. 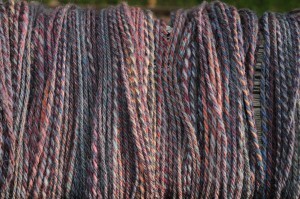 This photo is a bit washed out, but the actual swatch makes me think of an impressionist painting. 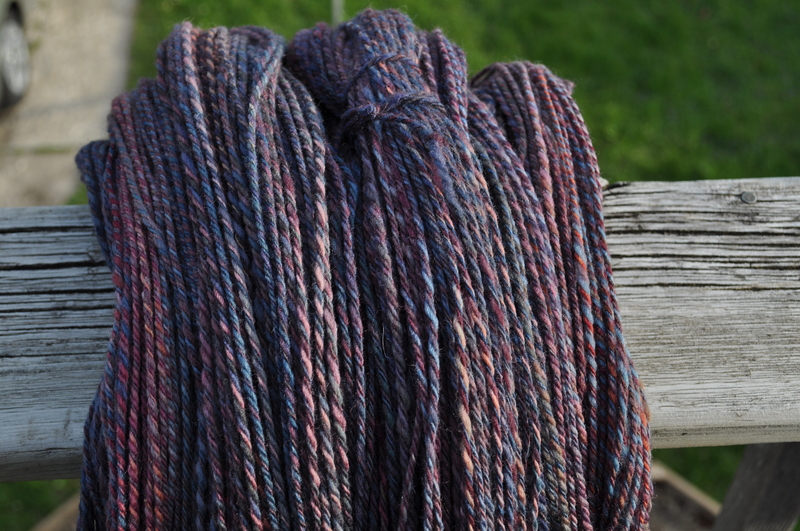 The color variation is more subtle, and I think I like it better than the Navajo-plied yarn, though I love the intensity of the solid colors in the Navajo-plied skein. 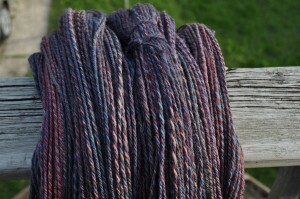 The Navajo-plied yarn is also much less even, because the plying amplifies all the irregularities in my single. Just goes to show that prejudices are not always well-founded, and that you can’t tell what a yarn will do until you knit with it. This little experiment is the first in my summer project. My grand plan is to dye up small samples of roving and then spin them in different ways to see what kind of variations I can get in the yarn, and then to see how those samples look knit up and possibly woven. I’ve wanted to play with this for quite a while now, and the package that brought the fiber for the new sweater also contained 2 lbs of Corriedale for testing. 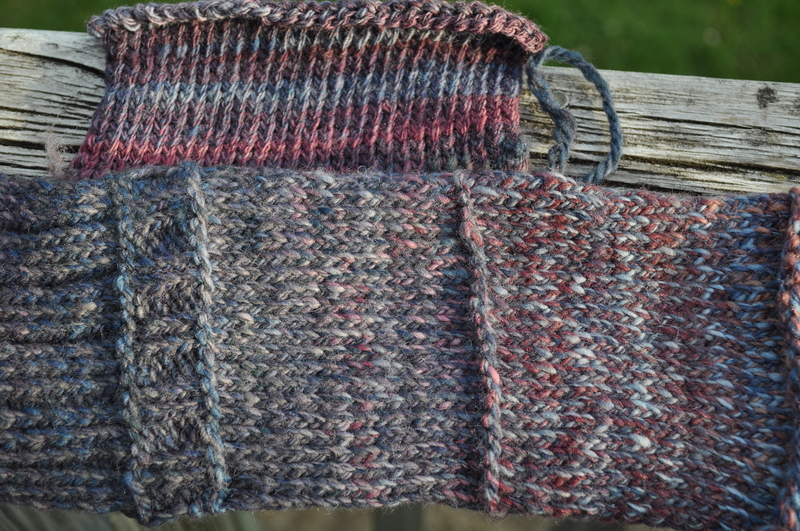 I’m not sure when I’ll get around to starting the project, but seeing the difference in these two skeins has made me really excited to see what happens when I vary more than just the plying. So many variables! Playing with color! If I learn as much as I did from this project, it will be time and roving well spent, and I am sure that there will be more surprises along the way. I love the you had a little left over to experiment. It’s always surprising to see just how different plying method will make the singles look. Both look nice yet so different. 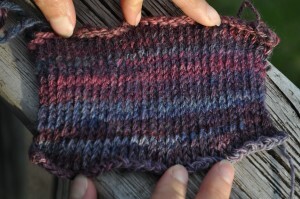 I agree and think the barber-poled method will look nice in the sweater, it makes a nice heathered look. Fabulous yarn, fabulous experiment. I would go with the Navajo for small projects where I wanted color excitment, but the marled is so much more subtle and therefore digestible in larger quantities. Someday I’ll start experimenting like you are – right now I seem to be in instant gratification mode. At least I can read your research reports! Looks like fun! The planned experiment should be especially interesting, and very helpful towards refining your spinning. DesigKnit is powered by	WordPress 4.8.9 . Page generated in 0.352 seconds using 37 queries.